Developed for demanding mowing conditions, the SLOPE-PRO® is a game changing step forward in operator safety and productivity. It features an ultra-low center of gravity for good stability and maneuverability while allowing the mower to cut on side slopes as steep as 50°. 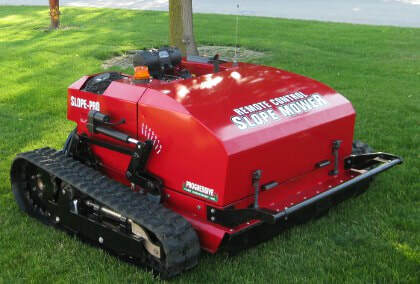 As a specialty application mower, the SLOPE-PRO® opens up new business opportunities and markets for grounds maintenance companies and landscaper contractors. The SLOPE-PRO® is designed, manufactured and distributed world-wide by Progressive Turf Equipment Inc.
To learn more about our offering of specialized grass cutting equipment for golf courses, sod producers, municipalities, sports turf maintenance and professional landscapers, please click here to view the main website.